Polonia celebrate a goal against Spalding with an 'I love you Angela' message. Photo: David Lowndes. Play-off experts Peterborough Polonia have won promotion to Peterborough League Division One for next season. 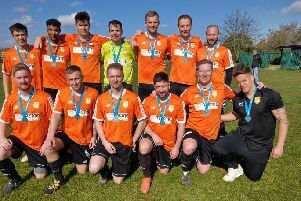 Polonia beat Spalding Town 3-1 in the Division Two play-off final at Yaxley FC (yesterday) to complete back-to-back promotions. Action from the Peterborough League Division Two play-off final between Polonia (red) and Spalding Town. Photo: David Lowndes. Polonia had also won the Division Three play-offs 12 months earlier. Adrian Mizia opened the scoring three minutes into the second-half before Marcin Stelmach scored twice in the next 20 minutes. Spalding replied through Alistair Morgan. It was tough on Spalding who had finished third in the table, 16 points clear of Polonia who had suffered six points-worth of deductions during the season. Oakham United Reserves and Glinton & Northborough were promoted automatically. Action from Peterborough Polonia (red) and Spalding Town at Yaxley FC. Photo: David Lowndes. The Division Three play-off results are the subject of a Peterborough League investigation after it was discovered Bretton North End and Eye United had fielded ineligible players in a tie won 5-0 by Bretton.